The Dominican Sisters of St. Catherine of Siena, Iraq, will be having their Chapter from July 1 – 10, 2016. 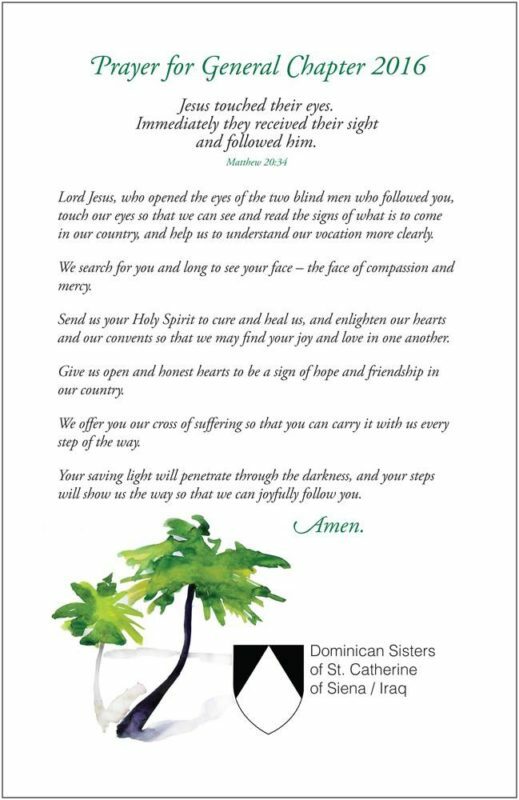 We invite you to print out this prayer and join them in prayer. Download the image here for printing with the artwork. Lord jesus, who opened the eyes of the two blind men who followed you, touch our eyes so that we can see and read the signs of what is to come in our country, and help us to understand our vocation more clearly. We search for you and long to see your face – the face of compassion and mercy. Send us your Holy Spirit to cure and heal us, and enlighten our hearts and our convents so that we may find your joy and love in one another. Give us open and honest hearts to be a sign of hope and friendship in our country. We offer you our cross of suffering so that you can carry it with us every step of the way. Your saving light will penetrate through the darkness, and your steps will show us the way so that we can joyfully follow you.